Peripherals maker portronics has launched a new small bluetooth speakers called the Sound Wallet in India. The speaker weighs 148 grams and has the dimensions 64.4 x 23.5 x 93.9 mm. It has an impedance of 4 Ohms and an sound output of 3W. It supports audio playback via bluetooth 2.1 and aux port. The Sound Wallet can be paired with iPhone, PDA, iPod, Computer, iPad or any other bluetooth enabled device. It is available in two colours, black and gold and is priced at Rs. 1,599. It is available via the company’s website. This Valentine’s day, Portronics, unveils a true love treat with the launch of an elegant portable speaker Sound Wallet. The swanky portable speaker is small enough to fit the palm of your hand. True to its name, the Sound Wallet is of the size of an actual wallet, is easily pocketable and comes in ultra-modern metallic casings of gold or grey. Portronics' Sound Wallet is a portable Bluetooth speaker with a range of almost 10m, giving you the comfort to play your music as and from wherever you want it. Elevate your music listening experience with Sound Wallet; that gets you crystal clear music with its Bluetooth capability; anywhere on the go. 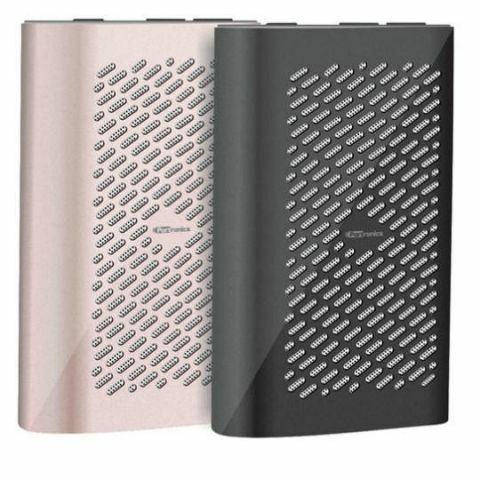 The magnificent Sound Wallet speaker comes with an enhanced rechargeable Lithium-ion battery that on a single charge can play for up to six hours. Recharge the portable speaker through the included micro USB cable. Sound Wallet has a power indicator that flashes red to let you know; well in time to recharge your speaker and listen to interruption-free music. The Sound Wallet is a stylised speaker which is impressive to look, compact in design, absolutely light in weight yet extremely powerful in its output. Sound Wallet has mellifluous sound quality and can be paired easily with your iPhone, PDA, iPod, Computer, iPad or any other Bluetooth enabled audio device. Portronics Sound Wallet is available in Grey and Gold. Are PORTRONICS SOUND CHIEF bluetooth speaker worth the money? best Bluetooth speaker under 7000 which has loud sound?